You Don't Know Man you Weren't There!! It is two years ago this month that it happened and I still wake up in a cold sweat with nightmares about those ten minutes in the Rhododendrons in the Knockmealdowns! Four young fit men following the east Munster way to the vee before heading on for the high summits. Somewhere along the way we overshot our turning point and ended up surrounded by the deadly vegetation. We had two choices, retrace our steps, or as stubborn men tend to do, beat our way forward. It must have taken us all of ten minutes to find that road and I was never as scared in all my life. The temptation was there to ring mountain rescue, but on this occasion we resisted! As well as the rascally rhododendron we have another major threat to life as we know it on this island. Yes, temperatures are due to hit a massive 29 degree (maybe!) in the west today. 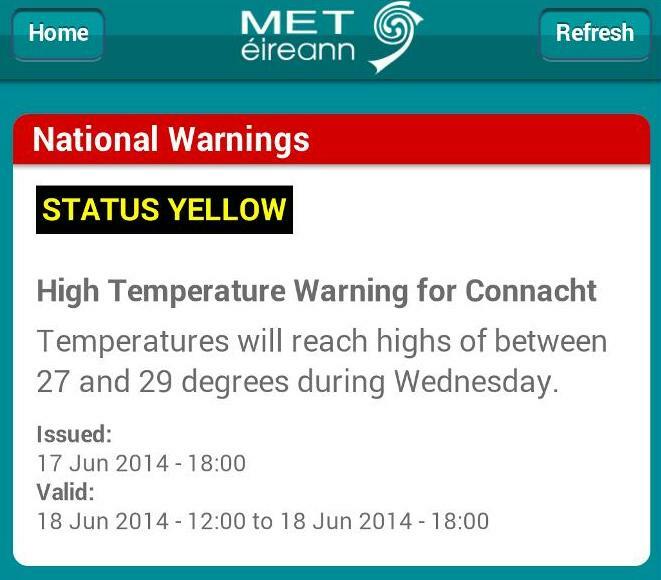 This apparently is sufficient to warrant a met eireann weather warning! I can just imagine them all on Joe Duffy this afternoon with their tales of hardship. Maybe just as well that we didn't qualify for the world cup, if a temperature below 30 degree triggers a National Warning! It would be remiss of me not to acknowledge the well wishes for our wander around Leinster at the weekend. Thank you all, I am indeed one of the many on here who are not well in the head, we kind of sleep walked up Corn Hill, but to anyone who has been to it, they will know that we missed nothing! GPS track details now updated if you want to look, still dying to know has anyone done this before us?